Your kitchen is the heart of your home – where everyone gathers to chat and relax, and, of course, to eat. 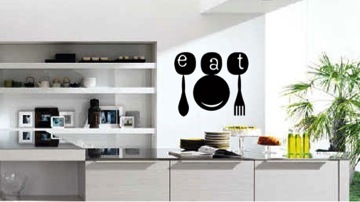 Add interest to your kitchen wall with our Eat Wall Quote decal. It’s the perfect addition to any kitchen and can be easily cleaned or repositioned. Your friends will be delighted, not only with the delicious tidbits you bring out for them to eat, but with the new addition to your wall. And you’ll be delighted, too, that you can add drama and design to your home without the fuss and mess of paint or wallpaper. It’s easy to clean or reposition, and as always, there’s no sticky residue left behind when you do move it. The decal is available in three sizes, from 70cm wide to 250cm wide. And it won’t fade or peel up at the edges. This new addition to your kitchen will last for years and years, just as beautiful as when you first put it up. 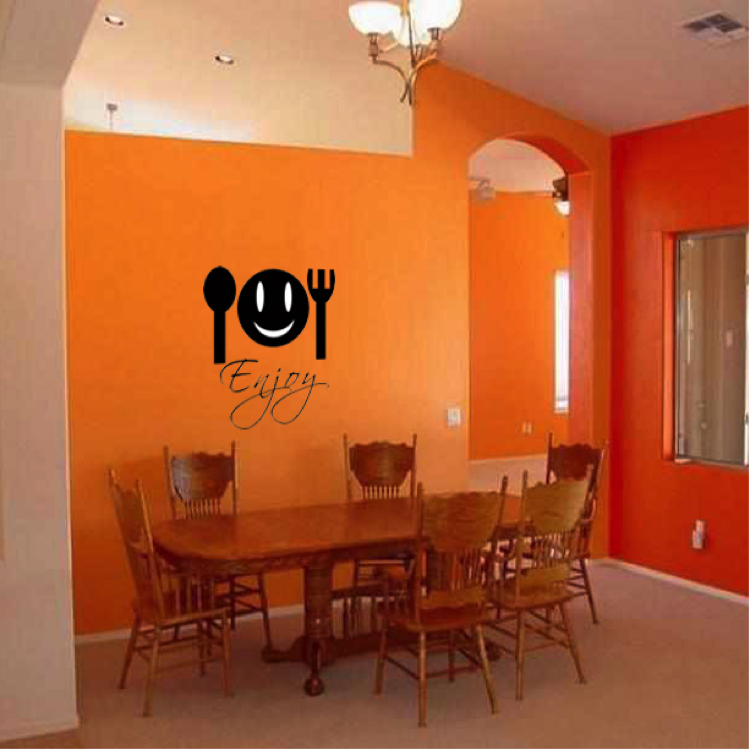 If this delightful wall decal leaves you hungry for more, you can bring a smile to your dining area or breakfast nook with our Enjoy Wall Sticker. This upbeat typographic word art makes a great addition to any kitchen or dining area in any house, no matter your decorating style. The Enjoy decal is available in three sizes, from 70cm tall to 250cm tall, to perfectly fit the space you want to decorate. Each time your family sits down to the table, their spirits will be lifted by this cheerful addition to your dining space. And you’ll be pleased, too, with the affordability and ease of use. You’ll get free shipping, anywhere in Australia (with low, flat rate international delivery elsewhere). That will certainly bring a smile to your face.